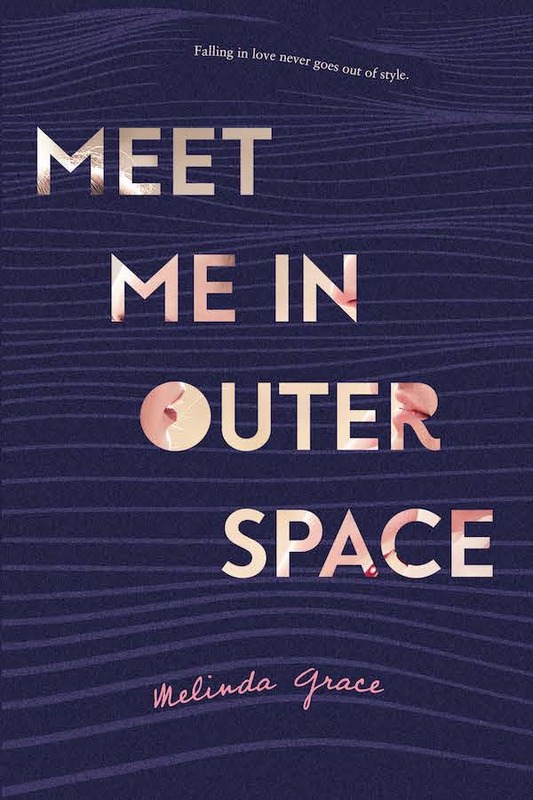 Meet Me in Outer Space is out in the world today, and I am so excited about celebrating its release with a guest post by debut author Melinda Grace! Be sure to check out my 4-star review of the book and see an aesthetic I created! Once upon a time, MEET ME IN OUTER SPACE had a subplot. A subplot that I loved with all my heart and soul. A subplot that I believed suited Edie’s character and story in a way that nothing else in the original draft had. In the original draft of MMIOS, Edie had an internship at a local high school as an advisor for a dress donation closet called Hello, Beautiful! This internship was part of one of her classes. The three high school students that ran Hello, Beautiful! were diverse, witty, smart, and, at times, totally clueless in all the best ways! I loved this subplot because it gave Edie an opportunity to be a role model. In the original version of MMIOS, Edie was much angrier and angstier about disclosing her disability. She was more forceful, defiant, resistant to help, disgruntled… and so putting her next to high school students who looked up to her was a great way (I thought) for her to grow. Lead by example. To give help and receive help at the same time, because these three awesome young ladies held up a big mirror to Edie on several occasions and forced her to take a hard look at herself. Some of the big changes that happened to MMIOS surrounded Edie’s own perspective, motivation, and attitude toward her situation. She was decidedly too angry, though realistic, not necessarily enjoyable to read. I wanted the reader to like Edie, but above all, I wanted the reader to relate to her. There were times when even I was annoyed with her behavior and because of this I needed to examine the parts of her that could be softened without losing the integrity of her very valid frustrations. Once these edits had been made, it was evident that Hello, Beautiful! and all that went with it, was no longer a necessary piece of the story. It no longer served the purpose it was intended for. When I received the initial email with the “hot take” of dropping it, I immediately reached out to one of my beta readers, Devon, to run it by her. Of course none of my beta readers wanted to say goodbye to Hello, Beautiful! but the more I thought about it, I knew it was what the book needed. I saved a new copy of the manuscript and went to work axing all the chapters (including the new ones I’d written to go along with the “new” Edie) and in all honesty, it felt like a tragedy. It felt like a real loss to the story…but then something wild happened…the book was better without it. The book made more sense without it. MMIOS didn’t need it like I had thought it did. The truth is, I needed it. I needed Hello, Beautiful! When I first started my journey to publishing, someone very close to me asked if I would be willing to change my book in a major way for the sake of publishing. I’d replied “of course” at the time because, well, of course I would. If an editor asked me to make changes I didn’t necessarily agree with I’d do it. I didn’t have the ego to say no to an expert. To think that I knew better than someone who knew the industry…but…and this is a BIG but…when you are actually faced with the words “cut” and “change” and “I don’t like this” everything you thought you stood for goes out the window. Your best laid plans are a hazy memory. Not everything you write is gold. The first draft is a living, breathing document. Sacrificing what you deem as essential can be super scary. It can seem like a terrible decision that you believe everyone will regret…but then also it can be the best thing to happen to your book. I was afraid to make the big changes, to do an overhaul and nix a subplot I loved, but like magic, Edie’s story clicked together the exact way it needed to. My editor reassured me that Hello, Beautiful! was a great idea and that it deserved a place in a folder to save for later. “Put it in a drawer and hang on to it,” she’d told me. So, the silver lining is that I took this discarded subplot and gave it it’s own full manuscript. Hello, Beautiful! may no longer be a part of Edie’s story, but it still lives and breathes. Melinda Grace wrote her first piece of fiction in middle school, but didn’t write a complete story until an introduction to creative writing course at SUNY Oswego, where she earned a BA in human development. She went on to earn a MS E.D. in counseling and currently works as a school counselor. When she’s not guiding the youth of America, she’s planning her next vacation to Disney World, laminating anything she can get her hands on, and binge watching Netflix. MEET ME IN OUTER SPACE is her debut novel, publishing March 2019. I don’t find too many college settings and this one sounds so emotional and fun to read. I loved the college setting in this one! I remember seeing this book when Swoon Reads first announced it, but then I forgot the name and lost track of it. I REALLY want to read this one! I’m so glad I saw this post! Yay!! I’m glad you were able to find it again! I love reading debut books. So fresh and unique. I enjoy debuts too! I love discovering new authors to follow and keeping up with their future books. I want to read this book! Is the giveaway international? Oops sorry for the late response! Since it’s hosted through Xpresso Book Tours and the publisher, it is US/CA only.